Mark your calendars. March 11th is the spring kickoff of Missoula Road Riding. 4pm - Group Ride - Meet at Big Sky Bikes on Front Street. Casual Turah loop followed by a climb up Marshall Mountain. The first male and female to the top of the mountain get a free entry to the movie that night. Jedzilla is buying! 5:30pm - Party - Big Sky Bikes hosting a party, brew, apps, and socializing. 7:30pm - Race Across the Sky Movie - Roxi Theater, tickets are limited. 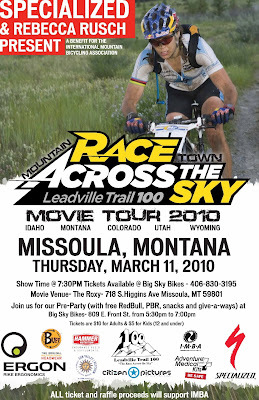 A movie about the Leadville 100 and Rebecca Rusch, 2009 champ. You can buy tickets at Big Sky Bikes from now until day of. Big time raffle. All proceeds benefit our local Missoula Mountain Bike Trails!